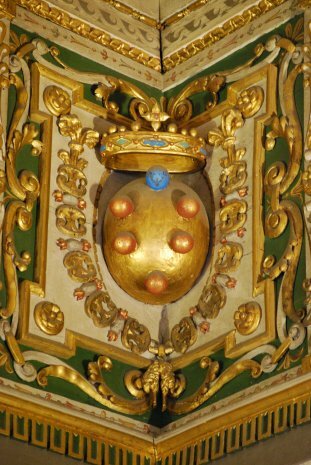 Anyway, this is yet another depiction of the well-known de’ Medici arms, this time in an interior up in a corner of a ceiling, surmounted with a coronet and surrounded by the collar of the Order of the Golden Fleece. 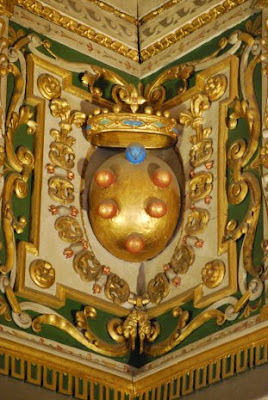 I wonder how much it would cost to get someone to do my coat of arms like this in the corner ceiling of my living room at home? Yeah, I guess if I have to ask, I can’t afford it. Still, isn’t this a great display of heraldry?